Essentially self-taught, Inness benefited from study of the old masters and extensive European travel. In Paris during the early 1850s, he was influenced also by French Barbizon painters, whose informal compositions rendered with bright, naturalistic color were often painted directly from nature rather than executed in the studio in the traditional manner. As his career progressed, Inness revealed an increasing interest in effusive light and color, expressive brushwork, and suppression of detail to create mood. 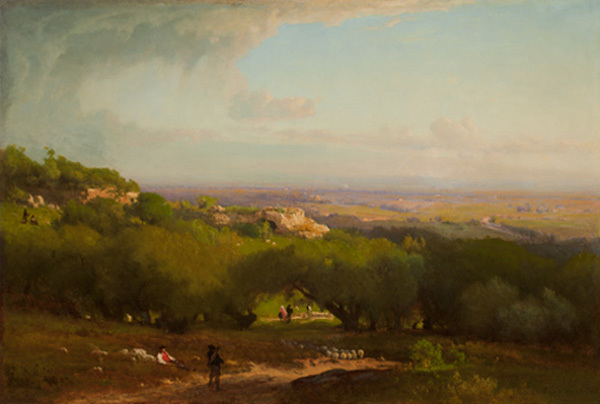 One of six landscapes by Inness in the Museum's collection, The Alban Hills was painted during his second European trip (1870-75), which he spent principally in Italy. He painted these scenic hills south of Rome many times, undoubtedly knowing that the subject would appeal to potential patrons. Yet specific details of the shepherds, their sheep, and rock formations are rendered in a manner then considered cursory, as Inness focused instead on the overall quality of light and color and the expansiveness of the vista to suggest a feeling of reverence for the nature before him.